Libelium announces the launch of OTA, a solution that lays the foundation for over the air programming (OTAP) for wireless sensor networks and the Internet of Things. This brings OTA capabilities for the first time to unlicensed frequency bands (2.4GHz, 868MHz, 900MHz) and to low power communication using protocols such as 802.15.4 and ZigBee. Over the last decade wireless programming or over the air provisioning (OTA) has been widely used by the mobile phone industry. This capability has allowed software updates to be delivered to mobile phone users and to enable the deployment of new services as they become available. So far, such capabilities have not been available to wireless sensor networks or to the Internet of Things. Such networks, usually consisting of hundreds or thousands of nodes (“motes”), would benefit from an OTA capability. Motes are often located in places that are either remote or difficult to access. Libelium OTA will enable firmware upgrades without the need of physical access. The new OTAP feature, together with battery recharging via a solar panel, will keep the maintenance costs of wireless sensor networks to a minimum allowing the deployment of networks with thousands of nodes. Firmware upgrades can be made within minutes and it is possible to choose between updating single nodes (unicast), multiple nodes (multicast) or an entire network (broadcast). OTA can also be used for the recovery of stuck nodes. Furthermore it is possible to find nodes in a particular area by broadcasting a discovery query. Libelium OTA can work with both direct- and multihop-access. 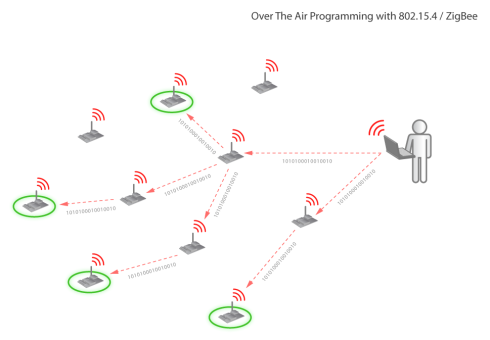 In the case of 802.15.4 networks, the nodes to be upgraded can be accessed directly by the gateway. With ZigBee, it is usual that a series of nodes must forward packets sent by the gateway to the chosen destination. When performing OTA with direct access the frequency channel used in the 2.4GHz band is changed so no interferences are caused to the rest of the nodes. The Libelium OTA provides two levels of security: - firstly the data transmitted is encrypted using the AES-128 algorithm; secondly a pass key must be authenticated in each node before the OTA process starts. For wireless sensor networks implemented with Waspmote, programs sent are stored in a 2GB SD card enabling thousands of different software versions to be stored and managed on a single mote. The management OTA application runs in Windows, MacOS and Linux and it is freely available for clients of the Waspmote platform. Libelium is launching a special training course at their headquarters in Zaragoza, Spain, in June for those interested in learning the OTA capabilities quickly. The first public demonstration of Libelium OTA will be performed from 6th-8th June 2011 on booth #500 at the Sensors Expo & Conference in Rosemont, IL, USA.